Think of all the plant handling that goes on whenyour customer is shopping -- from teh bendh to checkout to the customer's car. 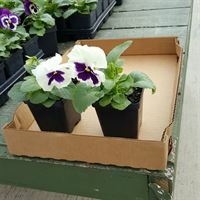 Instead of custoemrs fumbling with yoru plants, getting frustrated adn possibly damaging inventory, treat them to our handy cardboard trays. Our exclusive Shopping Trays can also add to your bottom line. It's proven fact that customers purchase more when they can carry more. Call (800) 433-8247 for more details on cardboard shopping trays. This new and exclusive product is sure to enhance the retail experience. Made of 1/8" cardboard, our trays ship flat but assemble in seconds. They're strong enough to hold 1-gallon pots or more. The base is 11" by 16" and will hold 12 bedding plants in 3.5" pots. Side walls are 2" high. Each bundle of 50 trays comes with assembly instructions. Copyright © 2019 Horticultural Marketing & Printing. All rights reserved.